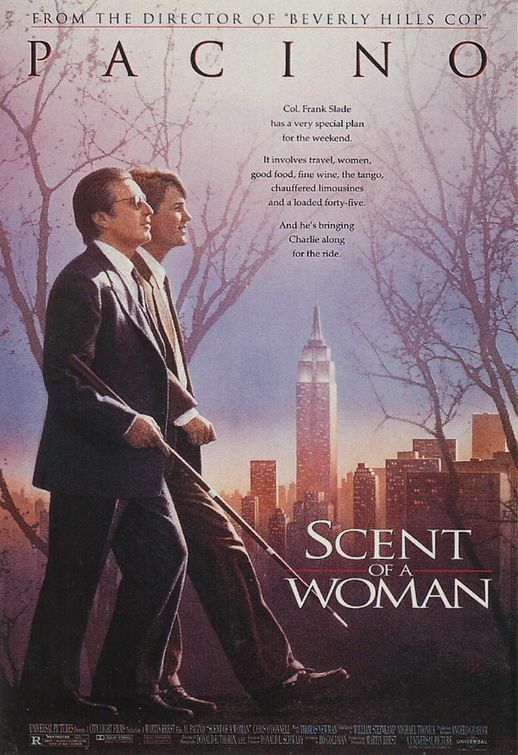 The movie Scent of a woman (1992), starring Al Pacino in an Oscar-winning performance, is known to many. But not too many of them know that the original is an Italian film made in 1974, Profumo di donna, with the great Vittorio Gassman in the lead role. Over the weekend I watched both, the Italian film on Friday, and the American version on Saturday. Of course, all the while I was itching to compare and contrast, as they say in school, and render my final vote for the winner. The story is based on a novel by Giovanni Arpino in which an embittered former Army officer who has been blinded travels briefly with a much younger man who is paid to accompany him. Let's just say that the blind and difficult officer makes the young man's life very interesting for a few days. In the Italian version, Gassman travels from Turin to Genoa to Rome and finally Naples. Pacino just goes from New Hampshire to New York City. The Pacino version, like many remakes, localizes the plot. In addition, the American version has a rather important subplot about the young man that is lacking in the original. OK, OK. Which did I like better? Film snobs love to pretend that all foreign originals are better and that Hollywood remakes are superfluous. There is, I think, a strong tendency for an original to be superior, just as original records tend to be better than covers. But while in the end I did feel that Profumo di donna was the better work, ole Pacino gave Gassman a run for his money and made a very fine and moving film indeed. The significance of the film is to explore the nature of being a man, specifically an adult male, when confronted by loss to manhood as occurs in major incapacity such as blindness. Both films find the protagonist overcoming his despair by becoming more of a human and less of a male. Their maleness is being overbearing, seeing women as objects, being callous and aggressive- taking forms such as seeking out prostitutes or (in the American film) leading a nubile young lady through a tango and a flaming Ferrari through the streets of New York, sight or no sight. Their humanity comes in the end when Gassman yields to the real love of the enchanting Agostina Belli, and Pacino becomes a father figure to his bewildered young companion. The American films suffers from the fact that the very things that make it more entertaining (it's over two hours, but doesn't feel long) also make it a lesser work of art. The subplot involving the supposed ethical high ground of not being a snitch is ambiguous and uninspiring, and the final Hollywood happy ending with cheering crowds and a potential love interest who comes out of nowhere feels somewhat false and manipulative. They're both rated highly on Imdb, 7.7 for the original and 7.8 for the remake (probably a preponderance of Americans voting for the remake). I recommend both.